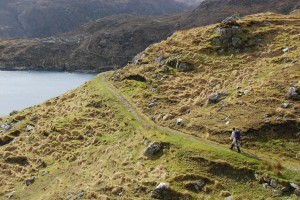 The population of the Western Isles declined by 9.9% during the 30 years from 1981 – 2011. However, during the last ten years of that period, it increased by 4.5%. This trend is reflected in Rhenigidale where the number of residents fell to 11 by the late 1980s. However, with the coming of the road and broadband links there has been an astonishing revival to 20. Of these there are are five children who take the school-bus to Tarbert. So the lone walker on the Postman’s Path is likely to have company when he reaches his destination. Next → Next post: Free As Air?